Save Historic St. Andrew’s (SHSA) is a neighborhood group composed of friends and community-members living in and around the Warrendale neighborhood where the former St. Andrew’s church has been a fixture for nearly a century. 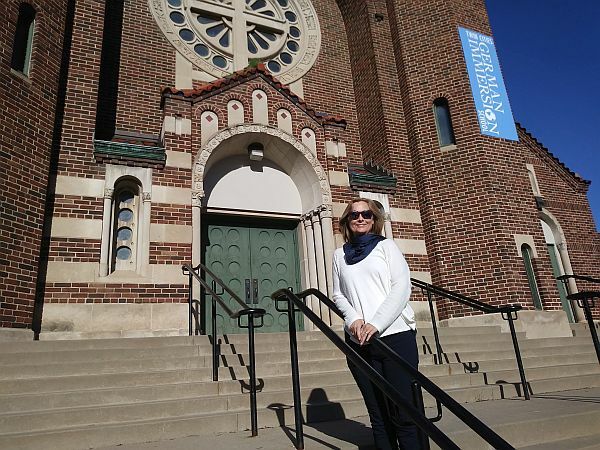 Our group formed in April 2018 when the current owner of the building, Twin Cities German Immersion School (TCGIS), publicly announced plans to raze St. Andrew’s and erect a new school building in its place to meet the needs of their growing enrollment. None of us imagined that this iconic, historic building would ever be threatened with demolition. At the very least, we assumed that any plans to alter the landscape where many of us live, work, teach, preach, learn, worship, or play would involve a robust public process in which the neighborhood was fully engaged. Unfortunately, the year-long process undertaken by the school in reaching their decision did not involve community input. Our goal is clear: Stop the demolition and collaborate to find alternatives. We are not angry, out-of-touch individuals with pitchforks. On the contrary, we are informed citizens who are seeking a sensible, well-reasoned approach to the management of historic resources and to maintain the residential and historic character of the Warrendale neighborhood. St. Andrew’s is of immense historic and cultural value and we are fighting to ensure that it receives proper assessment and protection, as allowed under city, state, and federal law. Saint Paul’s Comprehensive Plan clearly urges the exploration of alternatives to demolition of historic resources, particularly a culturally historic site like this building. We believe that taxpayer-funded public institutions—which include charter schools like TCGIS—have a responsibility to explore alternative designs that will allow historic buildings like Saint Andrew’s to be re-purposed to meet current needs, not destroyed. Saint Andrews is historic. It’s a cultural landmark and a mainstay of St. Paul’s Como Park neighborhood. This is not over yet. We hope you will stand with us. Together we can prevent demolition of this beautiful building and community anchor. History and place matter. The courage, sacrifice and hope of immigrants built this landmark. Their values and lessons endure and have been a part of this Como-Warrendale neighborhood landmark for nearly a century. We call upon our public officials to help find a solution that does not involve destruction of historic St. Andrew’s. There is only one landmark like this in Warrendale. And it’s not disposable. The community did not ‘abandon’ St. Andrew’s as TCGIS falsely claims. We are fighting for it, and St. Paul is watching. Should we respect the humble history of the immigrants who helped build Warrendale a century ago, a history memorialized by the landmark building at our heart, now threatened? Should we become leaders and set an example in collaboration, unity, preservation, design, education, and sustainability? Should we show the city that even in times like today, opposite sides can come together and solve problems together? Should we push beyond the school board’s siege mentality, false accusations, pretend indignation, and knee-jerk responses? Should we continue to encourage the school to broaden their options rather than bet their future on a singular insular, expensive, divisive plan? Should we push back when false information or rumor is spread via letters sent to the city? Should we remind people that the Heritage Preservation Commission ruled that St. Andrew’s is historic and should be saved? Should we reject claims that St. Andrew’s was ever ‘abandoned by the community’ and that its historic value evaporated when it was sold by the archdiocese? Should we continue to reach out to TCGIS, even when they deny us and declare they will not meet again with neighbors, nor communicate, nor collaborate on mutually beneficial solutions? Should we encourage TCGIS to get off the most difficult, pot-holed, risky, expensive strategic road possible and find a happier path? Should we continue our open offer to put down the protest signs and work together? Should we point out how “demolition by neglect” happens, and how the October surprise attempt at partial demolition that may have been a last-ditch attempt to undermine historic designation by the city of St. Paul? Should we resist misinformation spread to further the goals of people who would destroy a recognized historic landmark? Should we oppose claims that the community had its chance, now it’s too late? Should we push back on false claims, often repeated, that they considered all possible options and destruction is the only path? Should we continue to point out that we have brought them new options and have more to share, if they would only drop their guard and talk? Does it move you to know that you can see the same impressive façade and touch the same bricks and stones that Warrendale neighbors and immigrants did nearly a century ago? If you answered yes to any of these, we’d love your support. Your voice makes a difference. Please call and write to your elected officials! Let them know you support the preservation of our community history and heritage, not its destruction. Let them know you demand a model of real community engagement, not more developer tactics to brush aside the community. Let them know you want our publicly-funded schools to respect our history. Let them know you support a reasonable compromise as a solution. Let them know that destruction is not the only solution; there are better alternatives.